27 Mar LOOK OUT FOR THIS JAMMER ON THE TRACK! Sharna McClure loves the sport of Roller Derby! Jamming and rolling her way to the top! 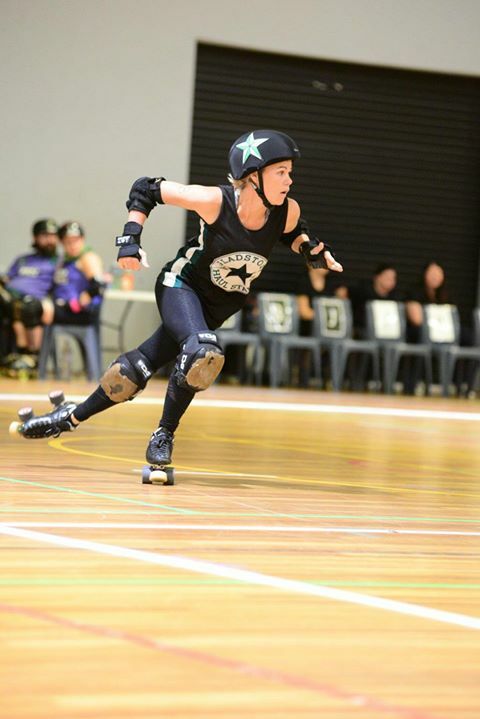 Since beginning her skating career with the Gladstone PCYC Roller Derby (GPRD) in 2012, Sharna has worked hard to develop her skills and had set her sights on representing Australia. A goal she achieved in February this year. Sharna is now raising funds to travel to overseas in July for the World Roller Games in Barcelona, Spain where she will put on the green and gold and represent Australia in the World Skate Roller Derby. After falling in love with the sport of Roller Derby, Sharna has spent the last few years honing her skills and fast developing an addiction to the thrill and life of the competition. Sharna’s selection in the Australian team is a massive achievement for the busy working mum of two. Known to her skating team-mates as Arrriba, Sharna’s fitness routine is managed and maintained by her husband Ross, who along with her two sons are excited to see what she can achieve. Sharna had a break from the sport while raising her two boys, and after returning to the sport and making the local GPRD Hustler’s team, she quickly found her place as a Jammer to be contended with by the opposition. Sharna is fundraising to help cover the costs associated with her trip to Spain. “The costs associated with this are very high, as we are fully self-funded. Any and all donations will make a massive difference,” Sharna said.